From the recent Innovation Forum newsletter, written and edited by professional writers and editors with long experience in sustainability. The UK Met Office has forecast that global warming could temporarily hit the crucial 1.5C temperature rise above pre-industrial levels within just the next five years. Numerous agriculture approaches are disrupted by the changing climate because of variations in seasonality, crop choices and cropping patterns. Advanced climate modelling shows that extreme weather events could wipe out food production if they happened in a number of key global regions at the same time, triggering widespread famine. Heat, drought and flooding could seriously affect maize production, for example, with scientists suggesting a 6% chance during every decade that a simultaneous failure in maize production could occur in China and the US, the two main growing countries. The Met Office study also found that across many regions, the probability of “severe water stress” is higher than if based on historical data. 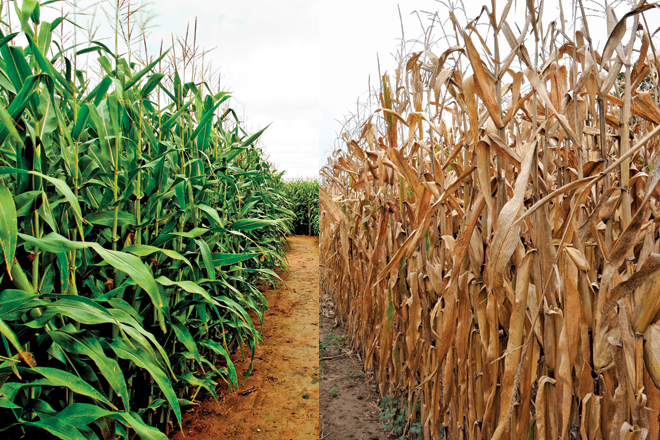 This means that adaptation plans and policies based solely on observed events from the recent past may “considerably underestimate the true risk of climate-related maize shocks”. The future of coffee is also at risk, with new research claiming that 60% of coffee species could soon be extinct. Senior researcher Aaron Davis at Kew Royal Botanic Gardens says that with so much deforestation going on around the world, “wild coffee species are being impacted at an alarming rate”. And according to a group of European researchers, current breeding programmes for wheat are “not sufficiently prepared” for the uncertainty and variability triggered by climate change. Not only that, but the diversity of wheat in most European countries has worsened in the past decade. Stephen Donofrio, director of Supply Change, an initiative from Forest Trends, acknowledges that for global commodity supply chains – such as coffee and cocoa – “climate change poses serious threats to production”. He also warns that climate change is likely to have “dramatic impacts on household-level production and consumption of maize, wheat and milk, which could also have resounding impacts on nutrition and other development metrics”. The just-released Global Supply Chain Report 2019 from CDP points to a mis-match in perceived risk of issues that directly impact agricultural practices. More and more companies now ask their suppliers to submit responses on water issues to CDP, for example. In 2018, the more than 1,700 suppliers that took part in the CDP survey reported $62bn of revenue as being associated with water security risks. But fewer than half of the companies that reported to CDP acknowledge C-suite oversight of the issue. More companies are setting supply chain water targets – growing from 51% in 2017 to 69% this year. But many are unable to provide detailed information to suggest they are properly recognising and taking action on issues that present a real risk, according to CDP. Reporting, monitoring and mapping suppliers continues to be crucial in understanding where and how farmers need to build greater climate resilience. Tools such as the World Resources Institute’s online Aqueduct mapping tool is helping companies to assess water risk, for example. And the sharing of lessons learned from companies that have already successfully implemented water management strategies is also helping. In 2018, 59% more companies set targets and goals around watershed remediation, habitat restoration and ecosystem preservation than they did in 2016, according to CDP responses. Troubled by the news that drought and heat could affect global yields of barley by up to 17%, brewing company AB InBev has turned to machine learning and big data analytics to develop more sustainable barley varieties. The new system, known as Breed, is helping the business to bypass generations of experimentation to control desirable traits, such as taste or pest resistance, and bring more resilient crops to market quicker. In South America, it has also invested in re-foresting 100 hectares of degraded areas, and preserving 120 hectares of forests in Brazil and Bogota to reduce sedimentation. As part of its €96.5m Cocoa Plan, Nestlé has, since 2010, replaced 12m old cocoa plants that were past their best, with hardier ones that will produce better yields for farmers in its supply chain. Nestlé’s plan is designed to ensure long-term supply security in a sector where yields have been falling for a number of reasons – with climate change resolution a central concern. The sustainable agricultural development of highlands project in north Africa, which faces persistent instances of drought, has made new planting materials available to thousands of farmers. In Egypt, high-yielding, rust-resistant wheat varieties have been distributed to 2,000 farmers. Meanwhile, improved wheat varieties that can withstand salinity and increase productivity were distributed to 12 African nations. New farming techniques are being introduced too. In Morocco, the project introduced farmers to a no-till technique to conserve water, which boosted wheat yields by at least 25%, and up to 300%, compared to previously used methods. According to the Business and Sustainable Development Commission, transforming our food and land use systems could generate $2.3tn in new value and create 800m jobs globally by 2030. Corporate procurement teams are the ones with the power to create positive change, says Hugh Jones, managing director of advisory services at The Carbon Trust. But he argues that to exercise this power they must “make sustainability a decisive factor in evaluating suppliers”, elevating it to sit alongside cost, quality, and security of supply. Only then, Jones says, “can a business truly claim it has sustainability at its heart”. This means procurement teams must understand their most significant impacts, ask the right questions, and actively provide support to help their supply chain to take action. Donofrio agrees, stating that while many companies talk about climate change mitigation, “adaptation and building resilience are referenced far less often”. While some companies discuss climate change risk assessments in their CDP forest disclosures, this is only a few, he adds. And even the top-performing companies don’t yet say very much. “In its 2018 CDP forest disclosure, Unilever mentions ‘climate smart agriculture’ principles, but does not specify how or where these practices have been implemented, or how to involve all specific stakeholders,” Donofrio points out. Scaling up such a transition to better climate resilience in agriculture will demand new and innovative financing and investments from institutions and using – and sharing – big data in a way that supports this change. The $129m committed by nine contributor governments as part of the adaptation fund announced during the latest UN COP negotiations in Poland, will help of course. The agriculture sector, including producers, traders, farmers and input suppliers, will need to innovate to increase productivity with technologies and techniques that safeguard environmental resilience and improve livelihoods. But, clearly, the entire food system will need to work together to solve the challenge. Join Innovation Forum and industry experts – including from Nestlé, Syngenta, PepsiCo, Ikea, Kellogg and Diageo – at the Future for Food conferences in Chicago on 22nd-23rd May and in London on 4th-5th of June.